It’s Christmastime and I’m rereading Jinx and Happy! and Catwoman, Ms Tree and Banana Fish because somewhere in my head Christmas = crime comics. I blame Shane Black movies and my mom’s tendency to watch shoot-em-up crime movies during the holidays. Even with this unseasonable lack of snow and the fact I went to zero Christmas parties this year (in fact, everyone I know in the city went to none; it’s that kind of year), this is still the season, and the season means people getting plugged on lonely streets, toughs with a hole in their ribs bleeding through their big coats and monologuing, betrayals, surprise garroting, and long last kisses that mean goodbye. 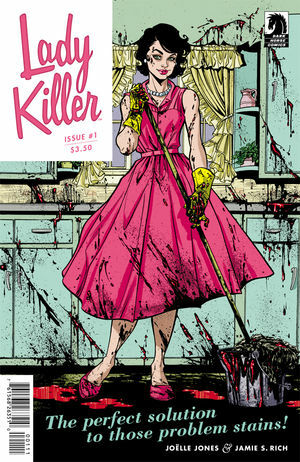 Joëlle Jones’ Lady Killer is a fun comic, that also twists the knife in your belly on occasion. You pay for it to. 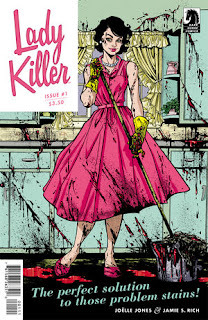 A hired murderer living a day life as a generic housewife in the early 1960s, our protagonist is not our heroine. We don’t get a hero in this. We get people who hurt people, hurting people, and hurting each other. And it’s funny. The individual chapters/issues are punctuated by fake period advertisements for handbags, perfumes, cars that ring true, but feature violence and condescension and key into the ongoing plots. It’s not quite breaking the fourth wall, but it is indicative that this is a comic that isn’t going to care much about any of those walls. It’s not a world, it’s theater. It’s farce and grand guignol in midcentury Americana gloss and pink plastic. I love a comic that I can stare at for ages, where every panel, each page begs to be looked over carefully and loved. Characters I can’t get a moral trajectory for thrill me, and here, everyone fits that category. But, if you want, it’s a brisk read and everyone is “bad,” too. It works both ways. It’s an incredibly smart comic in that way. A run only for the brave, the adventurous, those among us who can handle some severe cheese and fantastic with their crime. 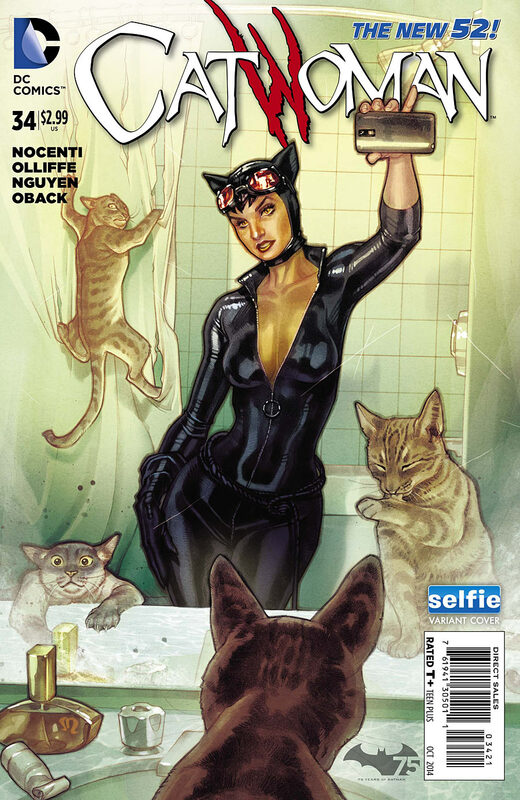 Ann Nocenti (who has looked like the “real world” Catwoman to me for decades now) is unafraid to get weird, satirical, symbolic, and funny with her comics and Catwoman is no exception. With eminently believable artists backing up the oddness, she throws Selina Kyle feet first into an exploration of the criminal community in the DCU, where supervillains can run small fiefdoms in the sewers and bored novelty crime elite participate in wacky races fit for Saturday morning cartoons. And, a petty teenager girl with a cat no one else loves is wearing the Joker’s face. His actual face. The one Snyder had him cut off and wear as a party mask. He lost it, and now this girl has it. You either embrace this and laugh along with our protagonist, or you run for the hills, but even if you run it’s still out there. This is what happens when you have Mirror Masters and Punch and Jewelees. When crime means giant typewriters and clues aren’t evidence unknowingly left behind but always deliberate hints and riddles for neurotics in costumes. You let the Penguin in… this is what you get. And, as we’ll see below with another run, Catwoman is adjustable. Part of a larger Event, which you all should be reading, too, this miniseries takes a step back from the cosmic nature of most of the story, to focus on a vampire and a killer in California, after a bad man. It’s crisp, it’s smart, it’s funny, and exciting. 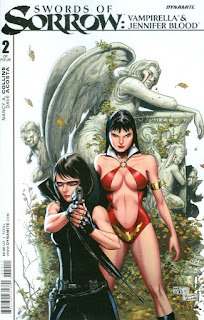 Vampirella sees the world as big and supernatural, she sees consequences in a long, long game, while Jennifer Blood is pragmatic, direct, and basically lives to mess up bad people in a terminal way. Putting them together, they may work together, but they’ll never be on the same side. Collins is too professional to just turn this into a character study or to skate by on fans of either or both characters meeting. Those are just two tools in a big ol’ toolkit brought to bear here. It’s a proper crime story, too, with local violations being as important, or more, than any big supernatural or cosmic to-do. The funny is funny, the action is fast and lethal, the horror is neither of the Boo! nature or a haunting dread, but of a pervasive aching truth. Bad things happen all the time, and it’s people that do a lot of them. There’s always some rotten sonofabitch out there. And, if we’re lucky, someone to take him out. Catwoman didn’t have a costume for her first appearance. She didn’t always have one, after that, and really, her costume has changed so radically from this version to that, it will never be the same as, say, the Riddler, Penguin, or even Lex green’n’purple Luthor. 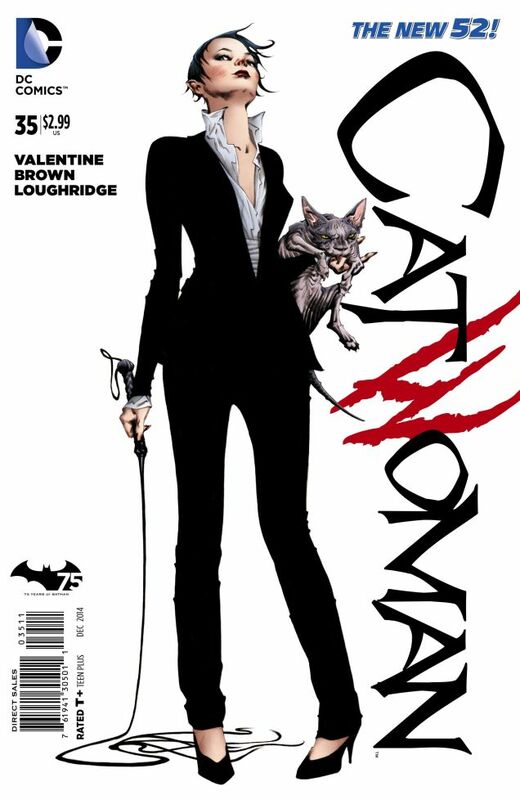 So, when Genevieve Valentine and Co took over the Catwoman monthly, they kept her out of any kind of catsuit and just put her in suits. We have another woman in the cat-costume. 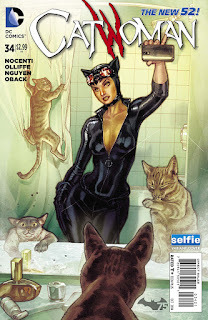 We have Selina running a crime family. Batman. Gotham. But it’s feels a lot more naked. I want to say it’s a very stripped down comic, but it ain’t. Brown (and then Messina) and Loughridge milk every panel for all the visual density and tonal intensity anyone could hope for. I get seasick looking at Selina and her guy Friday on at the docks, and I don’t even get seasick with real oceans. They can put Batman on every panel in a page, a bit of cape here, a shadow there, and still make me jump a little when he appears fully in the middle of that page. It’s a good comic that can make me feel cold, and a superior comic that can make me believe the writer, the artist, and the colorist are all, together, deliberately conveying the same chill they make me feel. By now, everyone writing about comics has told you to read Alias. Some also said to pick to The Pulse. Or, Brian Michael Bendis’ Daredevil, his Avengers stuff. Etc. I don’t want to be contrary, because those are fun comics, but: Jinx! Jinx and AKA Goldfish were my introduction to Bendis, so maybe I’m blind to their faults, because they still seem solid glorious gold. There are jokes about how bad Bendis’ art is, but don’t say it in front of me, or I’ll go for the throat. Not an artist for all seasons, but on something like Jinx, it’s perfect. The photo-referencing, the likenesses, the use of photocopying, the heavy blacks and the creative chiaroscuro make it look like nothing else and give it a rough and dense edge that many more polished artists would be afraid to run with. Yes, afraid. And, the lettering! They lettered the hell out of this comic. Inventive, creative. 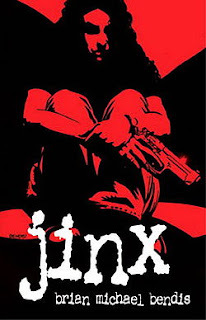 Jinx, as a comic, feels like someone burning to get noticed and firing off all their shots, using all their talent as hard and as strong as they can. Jinx is a bounty hunter with personal issues, but she isn’t a proto-Jessica Jones or a by-the-numbers riff. She’s a person from right out the gate. And, her world feels serious. The opening pages are almost entirely twenty dollar bills blowing through darkness and onto the street and that’s the comic. Money, darkness, and people crawling on filthy pavement is the comic. Sure, there are diners and offices, hotels and police stations, toilets and driver’s seats, but it all comes back to money and the street on which you stand. It’s the gravel biting your palms if you catch yourself as you fall.